It is the time of year when soups make it into our weekly dinner rotation quite often. For the most part they are pretty easy to throw together, feed us for days, and are so comforting on these cold almost-winter-days! This Butternut Squash Soup is no different! This recipe is actually one of the first recipes I ever “developed”. I’ve been making it for several years and have made a few adjustments over time. For example, I now roast my veggies for a deeper, more rich flavor AND I’ve added cauliflower because if you know me you know cauliflower is a top 5 food for me! Plus the taste of roasted cauliflower is unmatched! It also takes the creaminess factor up a couple notches in my opinion! This is probably my most asked for recipe as well. I’ve had many friends and family members request this recipe and I’ve gotten really good feedback— So if you try this I’d LOVE to hear what you think! A rich and comforting soup full of flavor! While veggies are roasting, sauté your onion, celery, carrots, sage, salt and pepper over medium heat until soft and translucent. Add your garlic and sauté for another minute or so then remove from heat and set aside. 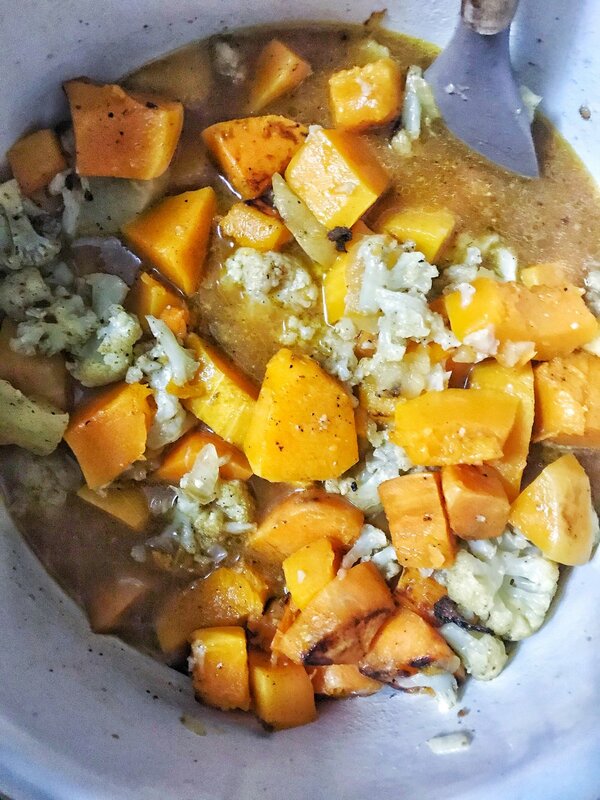 In high powered blender, combine your roasted veggies, sautéed veggies, and vegetable stock (you may need to do this in multiple steps depending on the size of your blender). Blend until smooth and then return to the sauté pan you used for your veggies. Stir together, taste and adjust seasonings to your liking. Serve with more fresh or dried sage, and a drizzle of coconut cream. It does not make your soup taste like coconut, just adds a delish and rich creaminess!